What's an OnB you ask? It's short for Out-n-Back. A few months ago I started dreaming of doing this ride along the Arizona Trail from Bismarck Lake trailhead just north of Flagstaff on the flanks of Humphrey's Peak to the point where bikes are not allowed, the South Kaibab trailhead at the rim of the Grand Canyon. I wanted to do the ride as a two day bikepack, but that meant two very long days. Heading north on the AZT would be about 85 miles and returning via forest roads would be about 80. Not a true OnB, but close enough. I first tried to organize this ride back in June, but I couldn't get the necessary time off from work. I re-scheduled it for a weekend in July, but AZ decided to experience a heat wave of our own where even the cool pines of Flagstaff reached 95º!! We called off that attempt as well. Finally, the monsoon flow broke and a weekend presented itself. I kept a keen eye on the forecast and when it looked favorable, sunny & 60's/30's, it was a GO. I reserved a couple of tent sites at the Mather Campground for our group, then packed up my gear to head north Friday afternoon. It was 88º when I left Phoenix at 3:30p. I stopped in Flagstaff for some dinner & breakfast for the morning as the sun was going down, it was now 52º. I drove around US180 to the FR151 turnoff and began the gradual climb up to FR627 and the Bismarck Lake TH. The sun dipped and set before I made it to the end and with it the temps kept falling. By the time I parked the car it was 34º. I opted to sleep in the car. I made myself comfortable, mostly packed up my bike for the morning when the others began to arrive. Derek, Jeff, Nancy, Caroline & Phil all showed, even with some phone directions!! We weren't sure about Ray, but if he was a go, we'd meet him a couple miles down the trail the next morning. I slept great for a few hours, then just reclined in the driver's seat until daybreak. It is now hunting season in AZ and they began arriving around 4:30a, a few had to be turned away due to the full parking area by 5:30. Darn mountain bikers! We started rolling up the trail around 6:30a over the frozen terrain crunching under our tires. According to my Garmin site it was 28º, a far cry from my recent sweat induced desert rides. I don't think any of us could feel our fingers or toes for at least the first hour. We were at least temporarily warmed by the first mile of bumpy trail up to the AZT. A quick re-group and the start of the 20 mile downhill ensued. We were carving the trail down towards FR418, where we may find Ray, when we kept coming across downed trees. Jeff and I moved one off the trail, rode over a couple of others and had to detour into the forest to navigate around a few more. This was the first time I'd ever come across a single downed tree on this piece of trail. There had been high winds in the area a couple of days prior and the ground was saturated from record rainfall this summer. Somewhere along the descent Jeff discovered his sealant was dry as it wouldn't plug a small hole. This would be the first of many tire issues over the weekend. This one was a quick fix, add sealant and go. One of the larger downed aspens. Enjoying the brisk morning down the AZT. Ray made it!! Easy to spot in his lime green recovery socks! We departed FR418 as the magnificent 7!! I was following Ray down the next section of trail, when he started to cross an angled small tree that had fallen. Next thing I saw was Ray flying off his bike into the pine needles!! So graceful. This part of the AZT is really nice, good flow, steady downhill through the trees. It also brought a rise in temps from the early morning frost. Caroline enjoying some sweet singletrack. Photo by Jeff. The trees start to thin out as we move away from Humphrey's Peak. Photo by Phil. The singletrack went on for miles, then we were dumped onto a bumpy forest road leading up to Missouri Bill Hill. 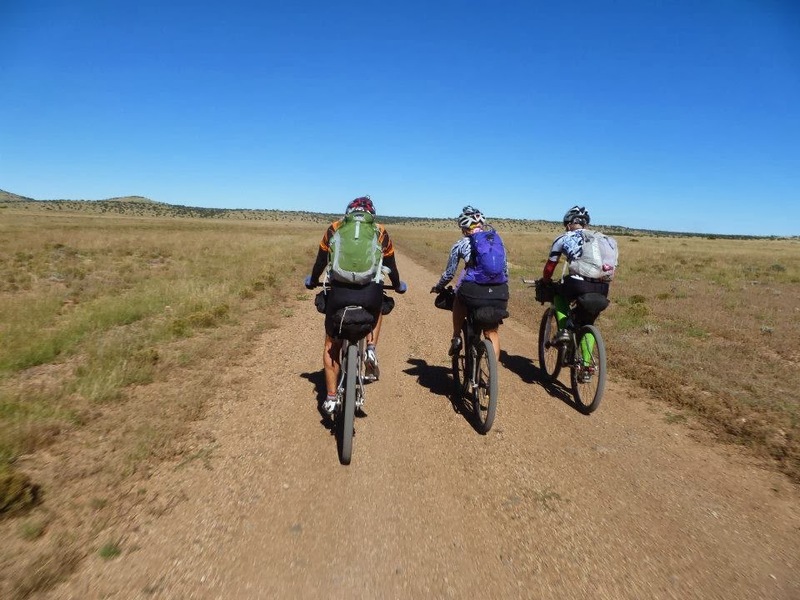 From there we dropped down a rutted road to the open expanses of Babbitt Ranch. My low tire tread had me sucked into a deep gully on the descent, but I managed to keep the bike upright. 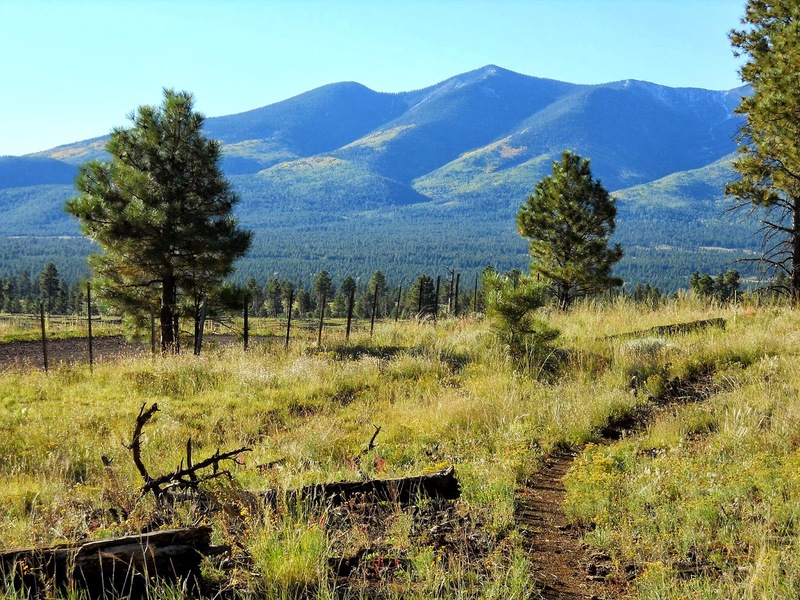 Babbitt Ranch starts passage 35 of the AZT and all but the last 5 miles are forest roads, fast forest roads. While there may not be much excitement on a flat open dirt road, the wide open spaces, unlimited views, solitude and raw beauty are unforgettable. I imagined this was what it would be like to Ride the Divide. Nothing like seeing the countryside by bike. Photo by Jeff. Singlespeed power unite! Photo by Caroline. Phil making his first bikepacking ride! 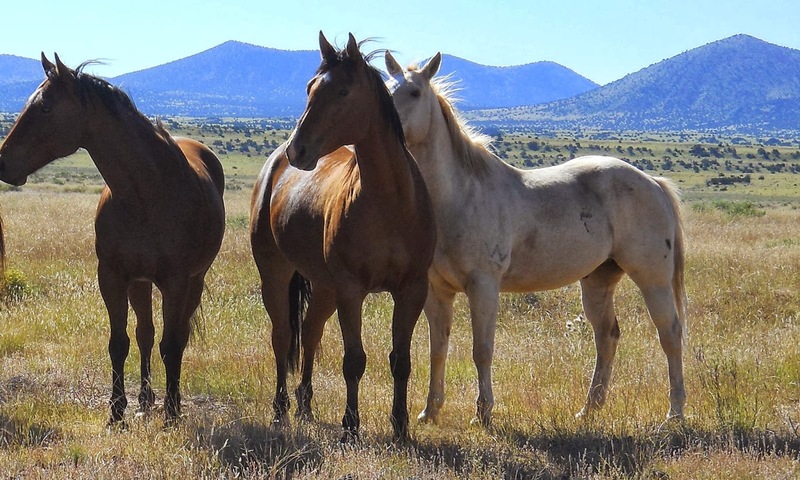 Some wild horses on the ranch. Good lookin' bunch. Photo by Phil. Still shedding layers as we ride a faint connector piece. Snack time along a rocky 2-track. Photo by Jeff. We crossed many gates, but this one had us stumped, so we hopped over the barbed wire. Photo by Jeff. We rode a few more miles on 2-track and eventually came to the vague split that I recalled from my last ride out this way. I noticed there was updated signage in the area which was nice as the old weathered ones were getting tough to read. Derek & Phil are ready for some prime primitive singletrack! Yeah, there's a trail out in that meadow. Five miles later we arrived at the end of the Babbitt Ranch passage and the Moqui Stage Station, which is no more than a crumbled arcing wall and a sign out by the dirt road. It was a good place for lunch about the halfway point. Derek & Phil were a little behind the group and mentioned jumping off route at the Grandview trailhead in favor of pavement to the campsite. We broke lunch and all headed north into the unknown for all of us, this would now start the Coconino Rim passage. One of the many gates along the route, this one in Russell Wash. Although this tank says otherwise, it's NOT Russell tank. Somewhere past a dry Russell Tank we came upon an active burn area. A bit disturbing since no-one was around and there was light smoke to ride through. Thankfully, it was only a mile or two before leaving it behind. Photo by Jeff. We came around a corner and were greeted with our first view into the Grand Canyon! It was enough to stop all of us in our tracks. Now we're getting close! We saw a sign directing us to a biking detour, huh? Then this sign. Yeah, whatever. Photo by Jeff. Ok, maybe we pushed our bikes a little, but only 5-10 minutes. We've seen worse! Photo by Jeff. Caroline at the Grandview trailhead & fire lookout tower. We were making good time. Roughly 65 miles in, 20 to go and it was 3:30p. We had about 3 hours of daylight to cover the last miles. 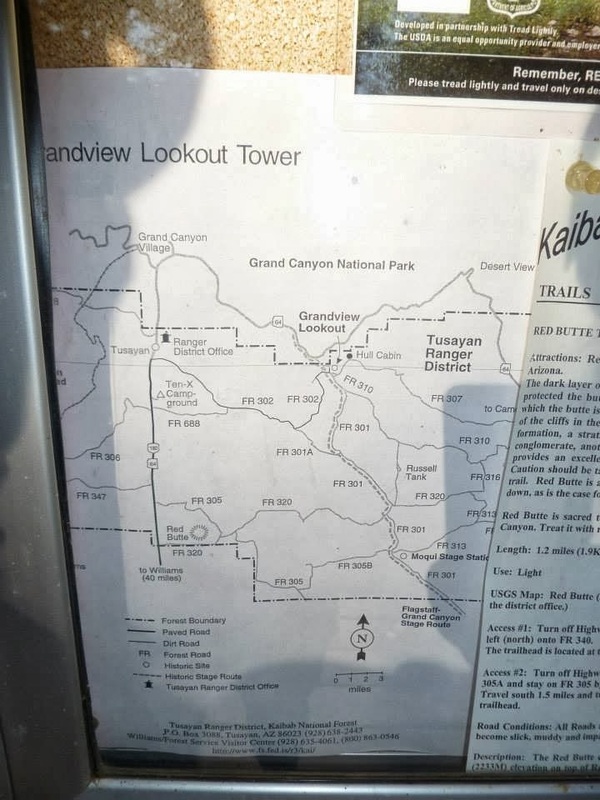 The Grand Canyon South Rim passage was rated 'easy' for biking so it wasn't going to be an issue reaching the S. Kaibab TH before sunset.....or was it? Jeff soon sparked our mantra for the next couple of hours, 'we're burning daylight', let's go. Of course as soon as we departed Grandview I had to stop for some pics as the forest floor was covered in a vibrant fireweed. I quickly caught up to the others...at another gate. I'm not sure who's tire went first, but it was contagious!! Nancy had a leak, then Ray's tire - multiple times, then Caroline's rear tire wouldn't hold air, then Jeff's, then Ray again! I was sure I was next, as my tires were the most worn to begin with. Ray tried his sewing method and I was eager to see it done firsthand, but after two broken needles we decided the Continental sidewall protection isn't meant to be sewed for repairs!! Time for the dreaded tube!! At some point during the tire saga I was ahead of the pack and arrived in Tusayan with the sun still hovering fairly high in the sky. There were now only 6 miles to go, we can still make it!! 5 minutes pass, then 10 when Caroline & Nancy show up. Another 5+ minutes elapse when Jeff & Ray get there telling of more tire woes. Now we're up against it, we're burning daylight!! Re-grouped we pushed onward to the north, skirting under SR64 onto a gravel bike path. The sun was not in full set mode as we neared a spot on the route that came very close to the campground. Rumblings of a mutiny began to surface after putting on our lights, at first I was very determined to reach the S. Kaibab TH light or dark, but as the final miles wore on the group was right. Let's head to camp, get situated and find some grub!! The rim can wait until morning. We checked in with the camp host and found our side-by-side sites. Barely 5 minutes later Derek & Phil rolled up! It was a relief to know they were there and already fed. They ended up popping out on the park road north of Grandview and hitching a ride in a carcass free bed of a park service truck, nice! The rest of us made our way over to the cafeteria and ordered up a few 10 minute cheeseburgers, I mean, really, 10 minutes to cook a cheesburger!! At least it was good. Back at camp I downed a cold one I shlepped all the way from Flagstaff and hit the sack. We tried to get going early the next morning, but the cold air and more tire fixin' made our departure closer to 7:30a. Nancy's tire was not cooperating. Derek & Phil opted to take what they called 'The Shame Train' back to Flagstaff. A shuttle service that ended up dropping them off at the train station, only leaving them to grab a taxi up the mountain before riding out to Bismarck Lake where the vehicles were parked. Sounded like they had a little adventure of their own. Before we left the two of them, they offered up a couple of spare tubes and other supplies we may need in light of the tire struggles on Sat. It was a kind gesture and gave our group peace of mind knowing that we had enough spares to handle a few mishaps on the way back if needed. Thanks fellas! We finally got to pedaling and made our way over to the S. Kaibab trailhead via the paved bike route inside the park. It's a really nice pathway and once it turns to the east it hugs the rim for jaw dropping views. I think this was my first time at the S. Rim shortly after sunrise and it was magnificent! Almost as good as the North Rim views. Early morning light on a clear day. Plateau Point trail visible in the foreground. Cool place to ride a bike! The gang all smiles at the S. Kaibab trailhead. We finished up our photo session and began discussing how we wanted to approach the return ride. I had routed the return to use some sections of the AZT where it was mostly downhill, but that added some extra miles to get there, plus the trail would be a little slower. We decided to swing by the ranger station to check on some maps of the area and still needed a breakfast stop in Tusayan. We really didn't want to finish in the dark. The route only needed minor tweaking. Photo by Caroline. All fueled and ready to go! Bellies somewhat full, route modified, we began our southern trek towards Bismarck Lake. This day was all about the forest roads and they were good. An initial short climb up FR302 got the blood pumping, but then things leveled off for a while meandering through canyons and past large open Kaibab-esque meadows. On one of the first downhills Ray pulls over, yet another flat!! What is it with this guy, always bringing the group to a grinding halt. Get it together man!! For those who know Ray, it pains him to slow down, rips at his gut to stop for more than 5 minutes, so I must poke fun when I can!! This is where we altered our route, staying on FR301. Proof!! Good thing he snagged tubes from Derek & Phil. That's more like it!! Plus, our first sighting of Humphrey's Peak. Ahh, lunch by the lake....well, sort of. The halfway point of the ride back came very quickly, so that put us all in a great frame of mind. A nice lunch break then a long canyon ride pacing a herd of galloping cattle led us into Babbitt Ranch. Somewhere along that canyon the grasshoppers began pelting us from their roadside perches, bouncing off my chest, hands and face occasionally. End of days?? This went on for miles as they would wait until the last possible second to leap into the air as we whizzed by. This dirt road led us out to US180 for a 13 mile pavement spin. Onward, towards the FR151 turnoff. The snow is now gone, but Humphrey's Peak is getting close. We had a surprise visit from Derek, he SPOT tracked us and was offering us goodies like a can of Pepsi!! Photo by Derek. Big open views, leaves beginning to change at the higher elevations. Photo by Jeff. Ray at the FR151 turnoff. Only a few miles to go! We bid farewell to Ray a mile or so up FR151 since he was parked by the AZT & FR418. The final four of us pushed on for a few more climbs up to FR627. Making the final push up the last climb on FR151, I felt really good on the pavement, but was starting to feel it on the last couple of grunt climbs. Photo by Jeff. FR627 & the final 1/2 mile to Bismarck Lake. That's honey all over my frame....and shorts.....legs.....and even on Caroline's bike!! We made it back to the vehicles around 5p, sun still high in the sky. This was such a fun route, wide open expanse of northern Arizona ranch lands, primitive singletrack, prime singletrack, of course the Grand Canyon, fast forest roads and a few good climbs thrown in. Thanks to Ray, Jeff, Nancy, Caroline, Phil & Derek for coming out on this Grand Loop. Linked in from your MTBR post. Great trip, great words, great images! Very inspirational.